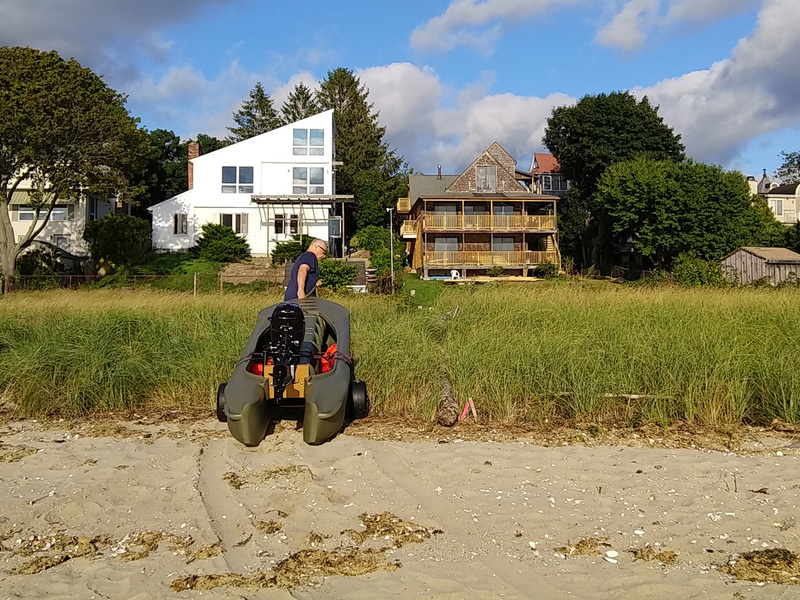 I live close to the water, and I need to transport my motorized Wavewalk S4 over mildly rough terrain, and a sandy beach. 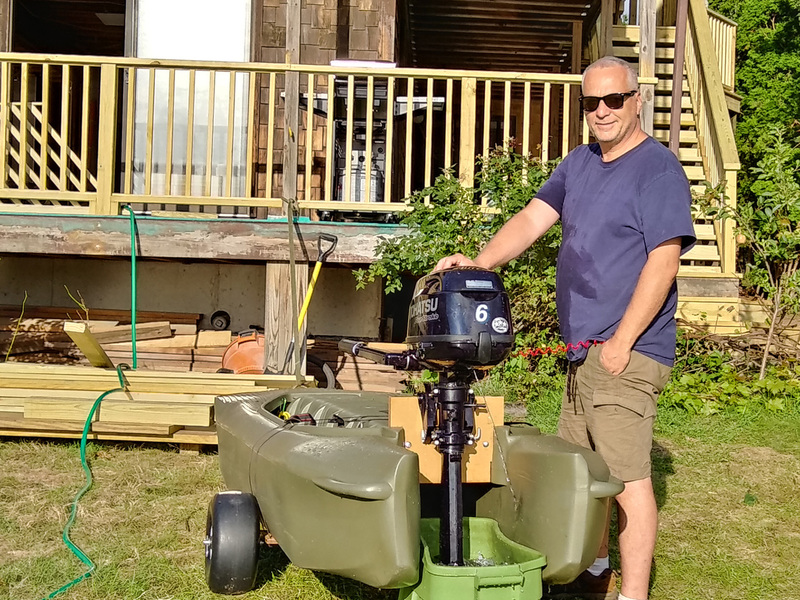 The outboard motor I use is a 6 HP Tohatsu that weighs close to 60 lbs, so carrying it by hand is not easy. Therefore, I had to make a trolley that features wheels that are bother high and wide. The trolley also needed to be transported on board the S4 without taking too much space. I made a simple wheel cart from a pair of 13″ high and 6.5″ wide flat-free (non inflatable) wheels, and 3/4″ stainless steel tube mounted on a 1/2″ thick plywood board. This structure is attached to the S4 by means of straps. The plywood board features a small wooden extension in its center. This extension fits in the first, widest slot in the S4’s front deck, and it allows to easily attach the wheel cart vertically, by means of a single shock cord (bungee). Launching with this trolley is easy, and so is getting the wheels under the kayak after beaching. The plywood is coated with two layers of urethane that protect it from the water. Pulling is done either by holding one of the two molded-in front carry handles, or a strap attached to them. 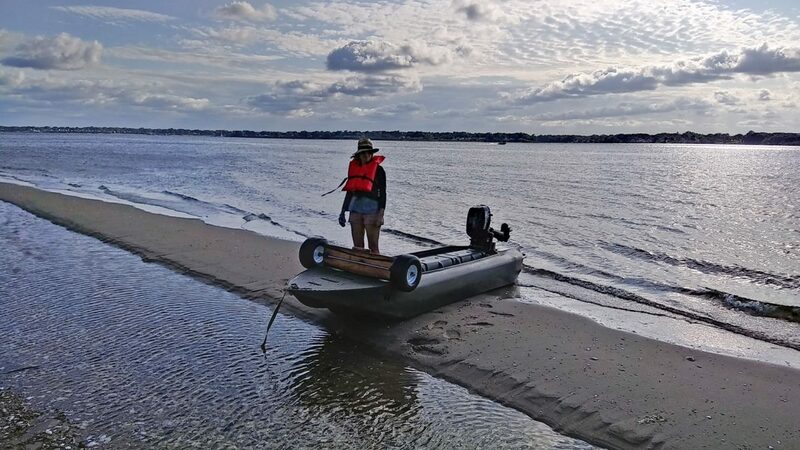 Since these wheels are, big, another thing that this wheel cart offers is to run the outboard motor in a bin filled with freshwater, in order to rinse the salt out of it. This way, the motor can stay attached to the boat, and be clean of the salt. I guess some readers may ask if this wheel cart offers the front passenger some protection from spray when the S4 moves in waves, and the answer is that it does offer a little protection compared to having nothing there. Hey Yoav………looks like you’re ready to rumble. That wheel assembly in front looks like it may also help counter-balance the weight of the rear motor?? Indeed, this wheel trolley is pretty heavy, and it may help balance the boat, to some extent. Nice job on the cart, fatter wheels pull through that sand nice and easy. Also a bonus spray shield. I wish it was “nice and easy” to go through the deep sand, but at least it’s feasible without an extraordinary effort. 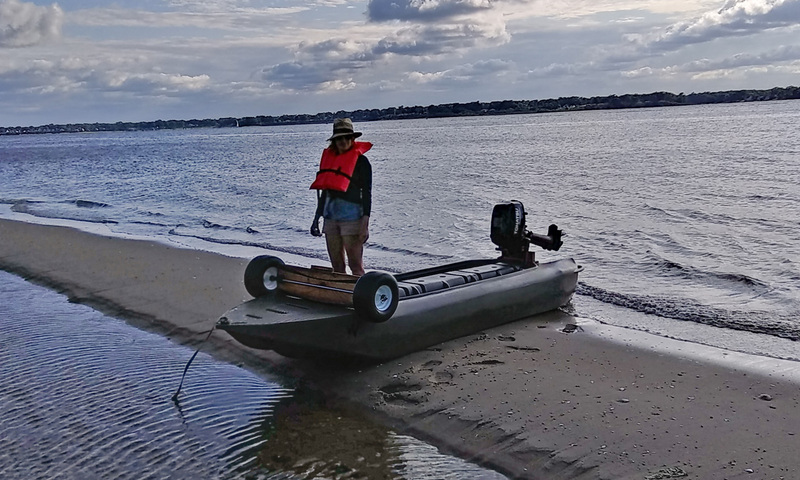 The S4 outfitted with a 6 HP outboard weighs 160 lbs, which is non-negligible.